The S2Maui VENOM from Artur Szpunar and Barry Spanier has a legacy of design experience creating the wings that powered many champions to the highest levels and, having returned to PWA World Cup competition, is proving its pedigree once again. EVIDENCE: After switching to S2Maui VENOM in 2017, long-time PWA competitor Antoine Questel has improved his provisional (6 events completed) slalom ranking by 10 places from the previous season, won the Japan World Cup Foil exhibition event and is on track for one of the best results of his career. Working together with feedback from our champion-filled World Cup and test team, Antoine Questel, Delphine Cousin Questel, Josh Angulo and Micah Buzianis, the 2018 VENOM leaps forward in performance and is our most lethal slalom race sail yet. WHAT IS IT LIKE TO SAIL A VENOM? Unrivaled design attention yield the magic combination of radical acceleration, power and speed with incredibly light and smooth handling. The VENOM is like a fine, lightweight sword in a field of heavy clubs. • TOP SPEED AND RANGE: New profile shape distribution and luff curve expands top-end wind range and speed while maintaining mid/low end efficiency (special focus in middle and larger sizes). • GUST CONTROL: New twist profile allows rider to better maintain position through gusty conditions commonly encountered on the race course. • STABILITY: New outline in middle and larger sizes lowers center of effort, increases stability and control. • ACCELERATION: Increased drive, lift and forward acceleration. • BALANCE AND SPEED: Built in “Leeward Pre-bend” shaping increases wing efficiency, balance and max speed. • CONTROL: Focus on control when overpowered with smaller sizes. • ROTATION: Cam pressure adjusted for best combination of profile stability, easy rotation and balanced power. 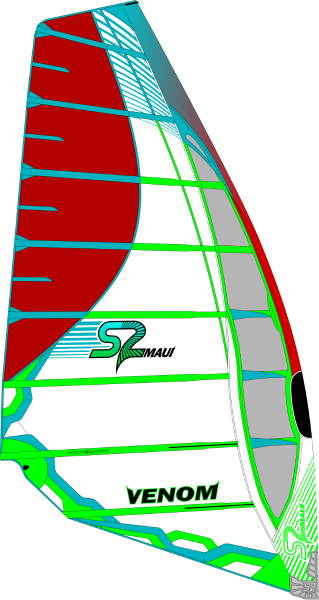 • The lightest World Cup Slalom race sail. • Optimized strength to weight ratio with high strength/ultralight Technora Spacelight™ upper body handles repetitive twist loads and progressive weight film lower body for crisp, responsive feel. • Multiple, full length vertical luff panels lock in shaping and resist stretch from downhaul loads. • “Light Tip” upper battens with custom fittings designed. Reduces sail weight further in most important areas and quickens leech response. • Varying Flex Carbon/composite tubes carefully suited to each batten position. • Durable mast sleeve top protector. • Abrasion protection of lower two battens in rigging and boom wear areas. • Extended sleeve bottom protection. • Improved high strength Nylon 66 Camber body with anchored stainless pins. • Reinforced leading edge at camber contact points. • Batten tensioner screw threaded tighter and sits deeper in tensioner to reduce loosening. • High strength Epoxy batten tips and close tolerance tip/tube interface for durability and smooth bend.